The guy sitting next to me said to his friend regarding the soba at Raku, “you’ll love it or hate it”. I had already started slurping away and I knew what he meant. It’s not your typical bowl of buckwheat noodles. These handmade noodles are thick cut and the densest soba I’ve ever had. The first bite I was caught off guard by the heartiness of the noodles. You wouldn’t take to bring your grandmother here. But I got into these chewy noodles as they are so different to the soba I am used to. Early lunch diners are given the option of extra noodles at no charge. At first I said yes. Come on, who says “no” to free food, right? But then I looked one of the diner’s bowls and realized it might be too much for me to chew. I asked the cashier if the “oomori” was an extra large portion and maybe too much to finish and he said that it was. I asked for a regular bowl and even that I could not finish. This is the tempura soba. Kabocha squash, eggplant, squid, and chikuwa tempura served on a bowl of noodles. Chikuwa is a fish cake that has been shaped into a log with a hole in it that has been grilled, not deep-fried, like many fish cakes. Chikuwa tempura is a classic topping for noodles in Japan, not only for soba but also for udon. When placing your order you have to specify hot or cold. I almost always order cold noodles with a dipping sauce as it is a great way to enjoy the texture, aroma, and flavor of the buckwheat noodles. At Raku the dipping sauce and noodles are served in the same bowl. 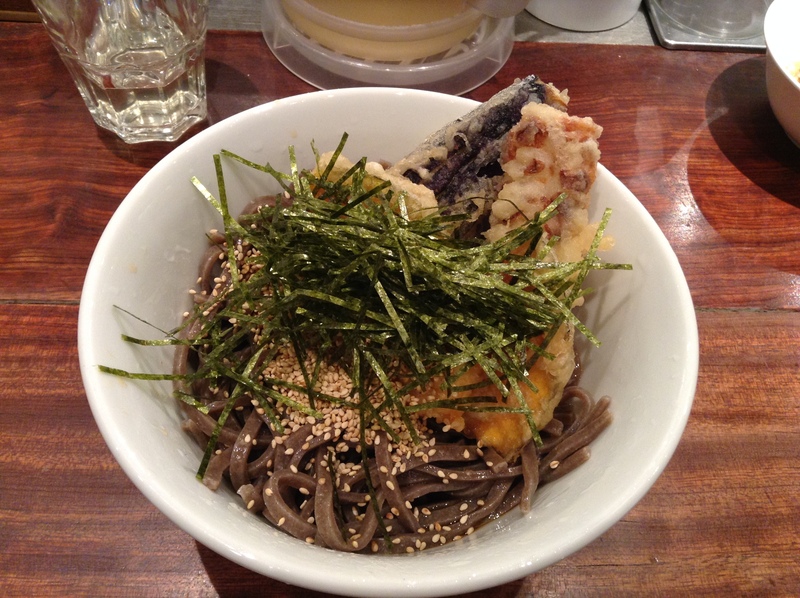 The waitress behind the counter generously tops each bowl of soba with two spoons of toasted sesame seeds and a nest of julienned nori. She has a rhythm down to topping each bowl and its done with speed in mind. On the counter are bowls of tenkasu, tempura bits that can also be used for topping the soba, highly recommended. Raku has two long counters facing each other with staff in between the two counters. The frosted thermos is filled with cold soba tea that is slightly nutty and very refreshing. If you order the cold soba noodles a server will bring you a black thermos with sobayū, the hot water that has been boiling the soba noodles. Pour a bit of this into the bowl and you can drink the concentrated sauce. My fellow diners were mostly salarymen eating a quick and affordable meal. No surprise as this is the Marunouchi business district. Most bowls are under 1,000 JPY ($10). The music was a surprisingly hip and upbeat salsa music. Not at all what one would expect to find at a soba shop, but this is not just any soba shop, what they are doing is definitely different. The shop was packed and I was there before the noon rush peak. I was impressed at the number of diners the restaurant squeezes into each counter. This would never pass in America, they would have taken at least two, if not three, seats away. I would love to come back at night some time. The shop has a small selection of saké, umeshū, and shōchū and some small bites like lotus root stuffed with ground meat and deep-fried chicken cartilage. And, I would love to try the nikusoba, a generous serving of thin-sliced meat over the noodles. My only advice, avoid the peak lunch time, there is always a long line in front of this shop. Thanks for this lovely recommendation! I was in Tokyo last week and Raku soba was most divine! Loved it! Thrilled to hear this! My girlfriend works near here and she said she loves this for lunch.